Ten years ago, I started experimenting with forest garden techniques in my allotment in Aberdeen. It’s been a long process. Along the way I’ve discovered a few things not mentioned in the breezier forest garden books, like that most of the UK research has been done in the South West of England and doesn’t necessarily translate to the North East of Scotland, or that a lot of the species described as ‘edible’ are edible only in the technical sense of ‘you can swallow them and not die (quickly)’, or that many of the species extolled will take years of detective work to track down and acquire. However, I have finally arrived at something that I’m willing to claim as a forest garden: an edible ecosystem to delight the eye, mouth, stomach and heart. An arrangement of useful plants, each in the ecological niche that they like best – niches created in many cases by the other plants. I have also realised that I have managed to extend the art in a few small ways. One is by testing what works well in Aberdeen. The situation these days is much better than when I started reading about forest gardens, when practically all the examples were from Australia, but there is still an ongoing need to develop experience in all parts of the country. This is my point in that dataset. I also think that my forest garden is unusual in its allotment scale. Most forest gardens I have seen or read about have at least a field to play with. I have had to squeeze things in and pay more attention to the ground layer. I’m jealous of course, but I also think that many more people have an allotment or small garden than have a field, so I hope the experience will be useful to others. I’m happy to show anyone who is interested around the garden, and also to share or swap seeds and planting material where I have surplus. Just email me. 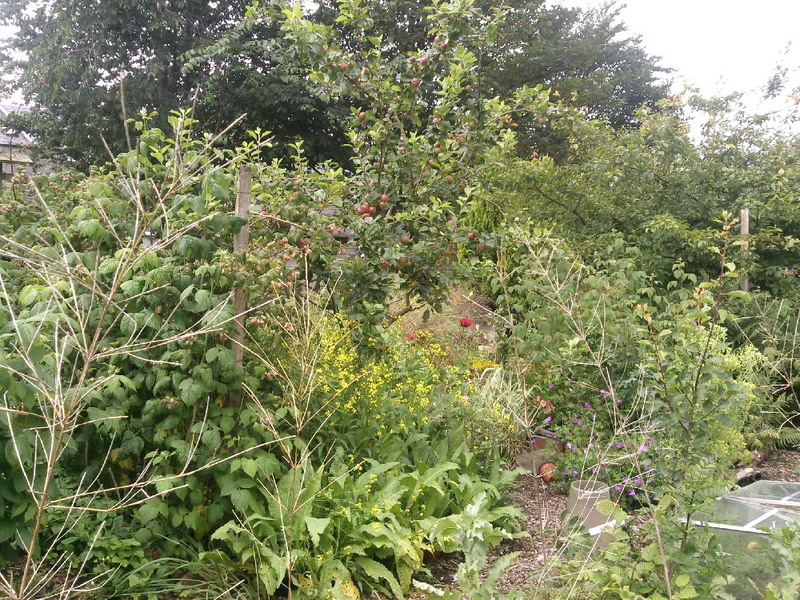 I’m designing a demonstration forest garden for my allotment site in Glasgow at the mo….The space I have is communal space adjacent to my plot..and is born out of traditioanl plotties wishing to plant fruit trees, but not necessarily on their plot cos of space/shade etc. South-facing linear edge of allotment site about 70ft by 30 ft but maybe with option to extend onto adjacent plot which is a bit bereft and abandoned at the mo….Im at the observation/design phase- hoping to plant up with bare roots this winter and establish the ground layer in the spring…..very excited to have your blog to learn from. Hello from the Netherlands! This is a great blog to stumble across and makes me feel less alone – I’ve designed and just started implementing a forest garden system on a small garden-size plot within a permaculture demonstration project. We are in year two and the biggest issues have been soil remediation (we have dusty, dead sandy rubbish) and finding the plants I want. Thanks for the useful feedback about how you use some of your produce – that seems to be a skill in itself. I hope over time we’ll be able to add something useful to this increasingly popular growing concept. I just linked to your blog through an article on our site, hope that’s OK. Maybe all we mini-forest gardeners should network somehow? I’m on quite a sandy soil too: nutrient poor but at least it’s freely draining and easy to work. As the organic matter builds up in the soil it should start to improve. You’re right about the ways of using the produce being an important part of the whole understanding. I didn’t think of that when I started but I have repeatedly found that my attitude to a plant has completely changed when I have found a new way to cook / prepare / preserve it. Best luck with your forest garden. Love your website! I am on the Olympic Peninsula of Washington State, USA – the far northwest corner of the U.S. Our climates are very similar. I greatly appreciate your practical view of things. We grow many of the same plants. Looking forward to reading more about what you have going & learning from your experience. I am trying to do more with perennial veggies. Thanks for all the great info! (see my main website at http://barbolian.com). Hi! I just read some of your articles and signed in as a follower. I’m Dutch, but I live since 6 years in France (right in the centre, in the middle of nowhere). I just found out about permaculture and realize that I already was thinking in that direction. But still a lot to learn! I’m sure I can do that by reading your blog. Thanks for that. All a great green new year! Can you tell me a little about your growing conditions? I see you began with sandy soil. What about the elevation, annual precipitation, average temperature, wind conditions, etc? I love to keep all that in mind as I look at a virtual food forest. (I live in north central new mexico in the states). The soil is sandy but now very black and full of organic matter. The elevation is close to sea level. Compared to New Mexico, Aberdeen has a very maritime climate – mild in the winter and cool in the summer. Scotland is very windy in general but my garden is pretty sheltered by the surrounding walls and hedges. For full climate details you can go to http://www.metoffice.gov.uk/public/weather/climate/?tab=climateTables and put Aberdeen in the location box, but bear in mind that we have a very variable climate and averages can be misleading – winter temperatures can get down to -15 degrees C for instance. I am really astonished by your achievements in such a small area against all the hard elements in Scotland!! I am considering to buy a smallholding near Wick which has about ten acres of land in view of converting it as a permanent food forest. Do you know if anyone has done such a thing in that area before? I am concerned about potential negative reaction from other traditional farmers in the surrounding area. It would be great if you can provide any pointers to any active permaculture communities or individuals. Hi. It sounds like you like a challenge! I don’t know of anyone who has done such a thing up there. I know of a couple on the West Coast but I don’t think Wick gets the same benefit from the Gulf Stream? The Permaculture Association would probably be your best source of information on whether there is anyone else locally. Concerning the local farmers, in my experience farmers are generally open to someone trying something new so long as they aren’t arrogant about it. Respect their local knowledge and they may well make your life much easier. I wouldn’t worry about what the neighbours think – what has it got to do with them? As long as the fences are good enough to keep their animals out – seriously. However they will probably be sceptical about whether it will work, and with good reason. My experience in the Hebrides suggests that it’s extremely difficult to get trees established in an exposed, windy coastal location. To the best of my knowledge, all that will grow in Caithness is grass! We also live near wick and are hoping to plan and plant a forest garden. Did you buy the plot and if so how are you getting on? Hi from Canada! Just wanted to say thanks for your blog and keep up your good work! Just stumbled across this, it’s a nice little blog. I just moved to a house in Dumfriesshire with a garden dominated by trees, and I’m wondering if forest gardening is the way forward. I’ve been interested in wild/perennial crops for a long time but the problem always is: do you want to eat them once you’ve grown them? As you say, gardening advice is rarely geared to the northern half of Britain so this is good to have. Lovely to hear you’ve developed a forest garden. I’m in the more northerly part of England and had been unwittingly been growing one since I moved in but my soil is poor for different reasons and before I bought my house I had scant knowledge of any kind of gardening. Hello, it’s very nice to hear about your Forest Garden, and especially nice to find out about things that grow well in Scotland. I’d love to know what you do with your annual beds. What crops do you have? Dig or no dig? Crop rotation? I am just getting started and trying to find a balance between traditional agriculture and permaculture ideas. I’m guessing you have some wise words on the matter. Some of the things I grow in the annual beds are traditional allotment staples, such as tatties, leeks, lettuce, peas, broad beans, cabbages and kale. Others are less traditional but similar culturally, like oca, Apios and yacon. A lot of things are allowed to self seed, including rocket, sea beet, parsnips, kale, mustard greens, coriander, radishes (for pods) and burdocks, so with these it is more of a case of ‘editing’ than traditional straight-line culture. Some things are grown on from propagules produced in the forest garden – such as spring onions from tree onions and spring leeks from Babington leek topsets. I dig in compost wherever I can – this is mostly generated by the plants in the forest garden, many of which have a dual crop/green-manure role. I do a five-bed crop rotation, but the self-seeding does tend to mess it up a bit! HI. I’m a novice pretty much to forest gardening and would like some suggestions for plants. Ive just cleared a garden of mostly ground elder and want to underplant the few fruit trees remaining.This garden is a threapeutic garden for kids with behavioural problems in Perth, so I’d like there to be lots to be edible/. If you only have a few fruit trees then pretty much the whole range of shrubs and ground layer plants are open to you. I’d suggest having a read through the plants on here and seeing what you fancy and getting Martin Crawford’s book ‘Creating a Forest Garden. Raspberries and strawberries tend to be particularly popular with kids: cultivated strawbs for the sunny areas and wild/alpine ones in the shade. A little question, whenever one reads on forest gardens they talk about 3-4 layers, well up here I never see more than two and normaly only one “layer” in any natural settings, I have some redcurrents (well about 15meters in total!) in a hedge, the end of the hedge is just about under an alder tree which isn’t exactly dense, and even then I find a huge drop in production, I also have some wild strawberries that were meant to be under the non shaded redcurrents, but again they are not really under but next to, there just doesn’t seem to be enough light up here to do multi layers. When I bought this property there were some old rhubarb crowns just surviving in a wooded area I’ve moved them into full sun and developed triffids! The only things that seem to grow under others are spring bulbs and ground elder, but even that dies down once the shrub/tree leafs up. So my question is, how many layers do you manage? I lived in aberdeen 7 years so I know what the climate is like, I’ve moved over the north sea, it’s a bit better here colder and warmer and a lot less foggy. You state somewhere that you’ve not found pears to work, I have two trees here one of which does very well, it’s growing in a bog but sheltedred from our very strong winds. (northWestern Denmark) we get up to 20 very occasionaly 25C in summer, and down to -15 on occasion, winter sits -2ish for a couple of months, no snow cover. Unfortunatly I do not know the variety of pear! Hi Sam. You’re exactly right. The standard model of forest gardening comes from the tropics, where it is accurate to talk about four layers, and it’s often uncritically applied to other biomes, which might have very different forest architectures. Under closed canopy high forest in Scotland there is typically a fairly sparse ground layer, never mind room for 2 more! I generally aim for a continuous ground layer with scattered trees and shrubs, so one to two layers.